Wednesday night: Very cold. Clouds slowly creep in. Teens to low 20s. Thursday: Cloudy & chilly. Few flurries or a quick snow shower. Low 30s. Friday: Partly sunny. Bit milder. Low 40s. We are now in the coldest of this cold outbreak, but the warm-up begins Friday. For now, we have temperatures falling into the teens overnight, and subzero well north. Also there are some ocean effect snow showers near Cape Cod, and an upper level low pressure system producing late night snow in western Massachusetts and Connecticut. No serious accumulations are expected, but we may start off the day slippery in spots. Northern New England should stay mostly sunny, however it’s mostly cloudy in southern New England with a high temperature in the 20s to lower 30s. Mostly clear and cold again Thursday night early Friday, low temperature in the teens and 20s. Clouds return on Friday especially southern and western New England as a low pressure system comes together will to our south. The weekend forecast is a major challenge. There will be several low pressure systems moving toward New England, but may end up staying mostly south, out in the ocean. If that happens we end up with a little bit of sun, warmer air, and perhaps just some light rain along the south coast. That’s probably the optimistic outlook. For now, we are going to call it a wintry mix Friday night, perhaps starting off icy in spots on Saturday. During the day we should brighten up in Vermont, New Hampshire, and Maine. 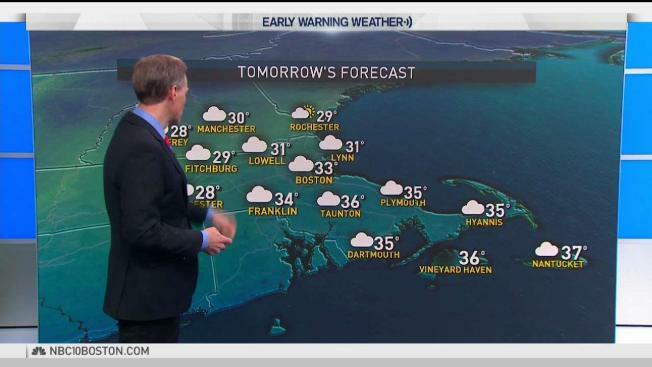 But stay rather gray, and possibly wet, in southern New England as temperatures rise above freezing in just about all of New England, and near 50° south. Low pressure will move away from southern New England, south of Cape Cod, Saturday night, but there may still be another system left over Pennsylvania, that one is going to move slowly in our direction with clouds returning. Perhaps we get away with a dry Sunday, but it looks like more wet weather is possible late in the day and especially at night. At the same time a new cold front will be moving in from Canada and we may end up with snow around much of the region Monday. That is still a really tough call, as temperatures get colder though, instability snow showers are likely much of next week in ski country.